Why our human brains are awesome, and how we left our cousins, the great apes, behind: a tale of neurons and calories, and cooking.Humans are awesome. Our brains are gigantic, seven times larger than they should be for the size of our bodies. The human brain uses 25% of all the energy the body requires each day. And it became enormous in a very short amount of time in evolution, allowing us to leave our cousins, the great apes, behind. So the human brain is special, right? Wrong, according to Suzana Herculano-Houzel. Humans have developed cognitive abilities that outstrip those of all other animals, but not because we are evolutionary outliers. The human brain was not singled out to become amazing in its own exclusive way, and it never stopped being a primate brain. 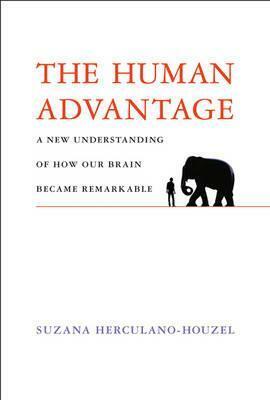 If we are not an exception to the rules of evolution, then what is the source of the human advantage?Herculano-Houzel shows that it is not the size of our brain that matters but the fact that we have more neurons in the cerebral cortex than any other animal, thanks to our ancestors' invention, some 1.5 million years ago, of a more efficient way to obtain calories: cooking. Because we are primates, ingesting more calories in less time made possible the rapid acquisition of a huge number of neurons in the still fairly small cerebral cortex-the part of the brain responsible for finding patterns, reasoning, developing technology, and passing it on through culture.Herculano-Houzel shows us how she came to these conclusions-making "brain soup" to determine the number of neurons in the brain, for example, and bringing animal brains in a suitcase through customs. The Human Advantage is an engaging and original look at how we became remarkable without ever being special.